Have you been searching high and low for an organic cotton slipper? So were we! and we finally found a slipper we love and know you will too! These easy slip on's are made with organic cotton terry, natural binding and a natural ruuber sole. They are light weight and easy to pack to take with you wherever you go! The perfect slipper for use just out of the shower or around the house to keep you toes nice and warm. We're sorry but this item is OUT OF PRODUCTION and our supplier is expected to resume production in SPRING 2019. 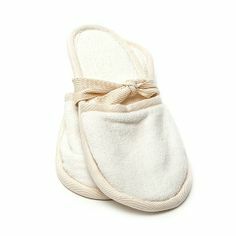 If you find (or know of ) anyone else able to ship Organic Cotton Slippers prior to SPRING of 2019 please let us know so we can work together to source the organic luxury you want. In the meantime, you can pre-order these organic cotton slippers here and be among the first to get them when they return to production.